Crofts Estate Agents are pleased to offer for sale with NO FORWARD CHAIN this three bedroom mid terrace property which benefits from having off road parking to the front and a spacious layout throughout. Located within the Old Clee area of Grimsby, this property is pleasantly presented and has been priced attractively. 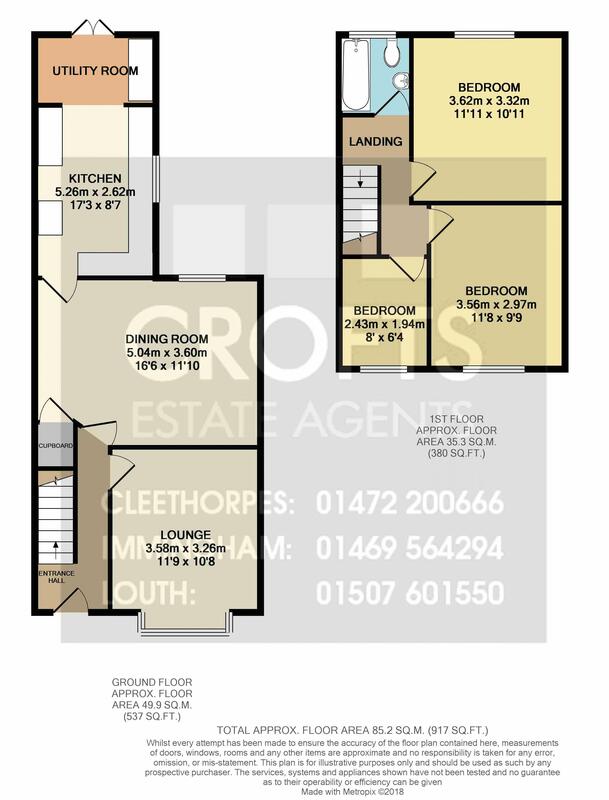 The ground floor comprises of an entrance hallway, front lounge with bay window, middle reception dining room and a large rear kitchen with utility section to the rear and double doors opening onto the back garden. The garden itself is low maintenance and is mainly block paved. The first floor of the house has the family bathroom which has a modern three piece suite, single bedroom and two good sized double bedrooms. Viewings are highly recommended. The front of the house is painted and has a bay window with a front door slightly set back from the front of the house. There are iron gates to the front which open up and provide off road parking. The entrance hallway is a bright space which is neutrally decorated and has a striped carpet running throughout which continues up the stairs and onto the landing area. The main reception room in the house is the lounge which is located to the front of the property and has a bay window which brings in a great amount of light. Much like the rest of the house, its neutrally decorated and has a gas central heated radiator. The dining room is situated in the middle of the ground floor layout and is a brilliant sized room. Running for the full width of the house, it has a window which faces down onto the back garden and a gas central heated radiator. Neutrally decorated throughout. There is an under stairs cupboard which is accessed from this room. The kitchen is a long room which has a range of wall and base units which provide an excellent selection of storage and worktop space. This continues through the arch into the utility room which has double doors onto the back garden. The Worcester gas central heated boiler is located in this room and there are spotlights throughout. The garden to the rear is all low maintenance and is mainly block paved. This runs from the back of the house up to the rear fence. The first of the double bedrooms is located to the front of the house on the first floor and is a nice sized room which is neutrally decorated and has a front uPVC window along with a gas central heated radiator. The second of the bedrooms is at the rear of the first floor and looks out onto the back garden. Another really good sized double room which has a brown fitted carpet and magnolia painted walls. There is also a feature period fire in the chimney which acts as a lovely feature of the room. The single bedroom is located to the front of the house and is neutrally decorated throughout. There is a fitted carpet and a gas central heated radiator in the room, along with a front uPVC window. The family bathroom is a modern room which has a three piece suite including a bath with shower over and glass shower screen, wash basin, toilet and a chrome towel heater. A really nice addition to this modern family home.